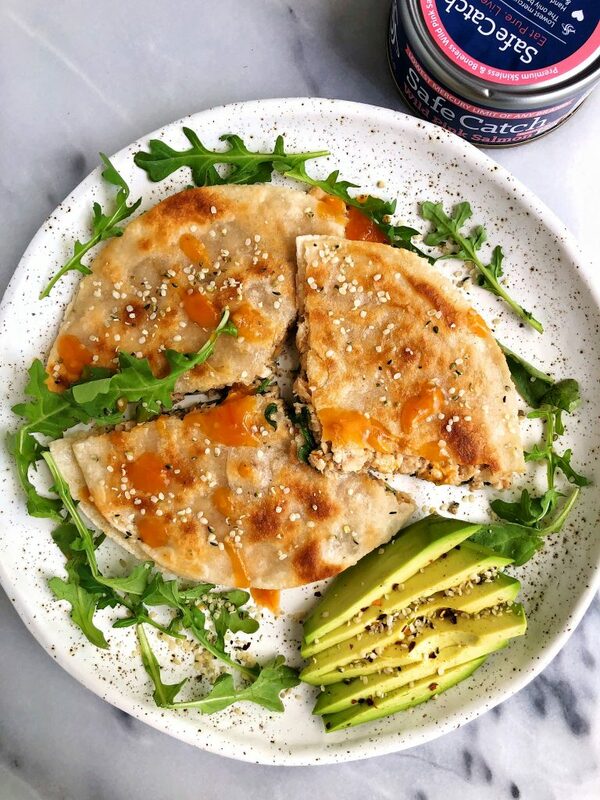 Super Simple Spicy Salmon Quesadilla made with gluten-free ingredients for a healthier quesadilla recipe! If you are ever wondering what I am eating for lunch or dinner, there’s a 95% chance it is this spicy salmon quesadilla lately. I have been on a serious quesadilla kick for the last few weeks and I am absolutely obsessed. I love how simple and easy they are to make and they taste 100x more indulgent and gluttonous than they actually are. 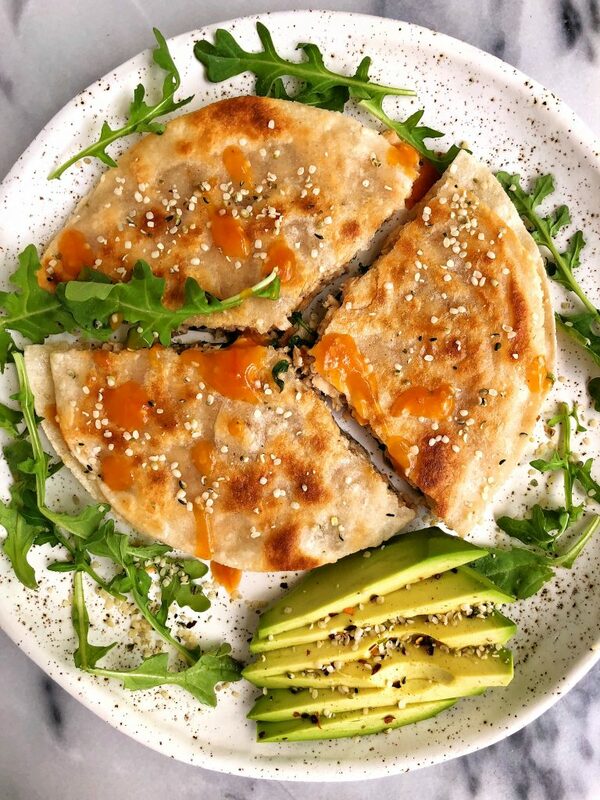 Coming from the person who doesn’t like traditional cheese quesadillas (I know, I’m weird), I created this healthier twist on a quesadilla to enjoy. I love how the possibilities on what to add inside are endless, but lately this spicy salmon combo is my go to. I use Safe Catch Wild Salmon, some avocado mayo, hot sauce and black pepper to make a “salmon salad” of sorts. Kind of like tuna salad except with wild salmon. I add it to my favorite tortillas with some goat or feta cheese or a nut-based cheese, with some leafy greens and sliced avocado. It gets so crispy and oh my gosh – I want to make another one right now. Safe Catch’s Wild Salmon is a complete game changer. I love all of their products because they are quality fish we can actually trust and they have the best tuna (lowest in mercury) and you can make so many things with their products. I love making easy salmon burgers, tuna stuffed avocados and more using their canned fish. I have a feeling you guys are going to love these quesadillas as much as I do and I cannot wait to see yours in action. Don’t forget to tag me on Instagram when you make them too! Add another tortilla on top (grease the top of the tortilla) then add to the skillet and cook on medium heat for 5 minutes then flip and cook for another 3-5 minutes or until the tortilla is crispy! Thank you Safe Catch for sponsoring this post. It means so much to me to work with brands I love and believe in! 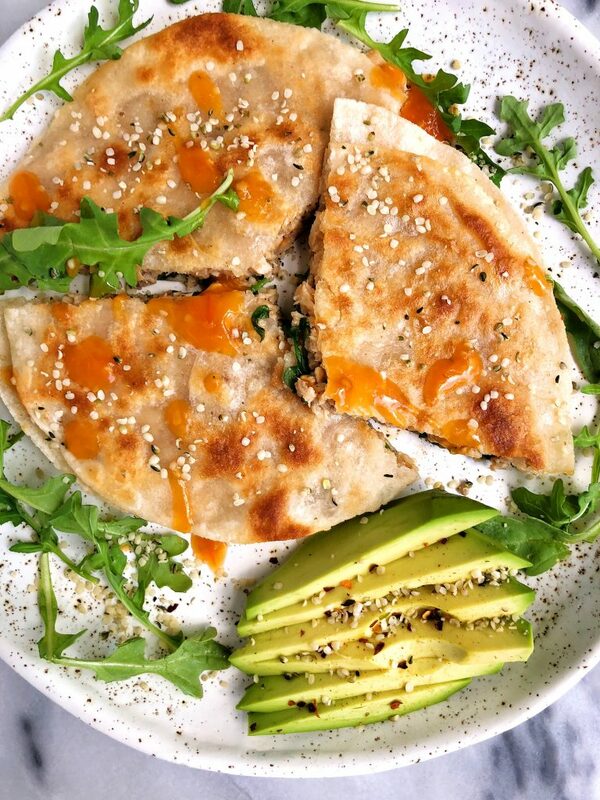 I’ve never tried salmon in a quesadilla before…but this looks and sounds delicious! So helpful it’s made with pantry-staple ingredients too. THIS. LOOKS. INCREDIBLE. I just bought some canned salmon to eat the boring way (with crackers), but my plans have officially changed! Thank you for this!! This looks AMAZING. Love salmon & i’m obsessed with the siete tortillas so i’ll definitely give this a try this week! Where are these plates from? I’m sure you’ve noted elsewhere but they photograph really well! Working on honing in my food fotog skills – your tips in your favorite things have been helpful! Teetering on buying the tabletop light…. eek.